A Memorandum of Understanding (MoU) was signed between Department of Defence Production and Goa Shipyard Limited (GSL) recently, a Miniratna Defence Public Sector Undertaking (DPSU) for the financial year 2017-18, said a Defence Ministry release. Notably, in the financial year 2016-17, the Shipyard achieved historical high VoP of Rs 1,030 Crore and PBT of Rs 177 Crore.GSL has crossed Rs. 1000 Cr in VoP first in its history and has become second largest DPSU shipyard in the country in term of Value of Production. 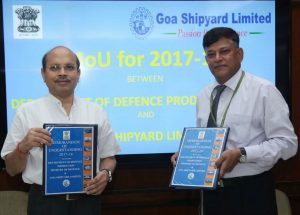 GSL was adjudged as ‘Best Performing Shipyard’ by MoD. The target for PAT to net worth ratio has been set at 13.30%. Export target has been set at 28% of ‘Revenue from Operations’, which is highest among DPSU Shipyards, it added.